Some consider meat eating unethical due to its environmental impact, animal cruelty, human health issues, or various other reasons. They might like to enjoy an occasional juicy grilled beef steak, but can’t quite justify it. If this includes you, here are my top five reasons why you should go ahead and enjoy real grass-finished beef. 5. It’s healthy. For 50 years now, the medical world has been warning us about the hazard of red meat to your cholesterol and arteries. It’s time to get updated. That warning is tied directly to the timeline of the rise of Confined Animal Feeding Operations (CAFOs) that rely on unnatural diets of high carbohydrates, generally corn. By contrast, the recent return to pre-1960s era beef, i.e. grass-finished beef, has led to a beef product that is literally native to our diet and naturally provides healthy protein and fats. 4. It’s good for the animals. Animals raised in open pastures are healthier, need less human handling, need less drug intervention, and have a longer life span. 3. 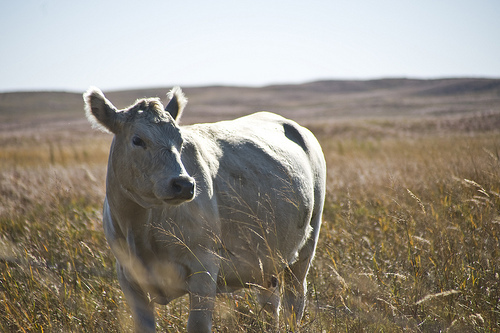 It’s good for the ranchers and farmers who produce grass-finished beef. Remember, there are people in this equation. Open space, green pastures, and lower stress levels all contribute to the betterment of the ranching family’s life. 2. It’s good for the water and nutrient cycles. There is a lot of misinformation regarding the depletion, degrading, and general ruining of water and mineral resources by livestock. CAFOs are largely to blame. However, ruminant animals have been out in pastures since the Stone Age. They are an integral part of the carbon cycle, the nitrogen cycle, the water cycle and every other cyclical pattern of nature. Ruminant animals are the keystone in converting otherwise undigestible plant material into something useful to mankind. 1. It’s the right thing to do. Judicious inclusion of natural, grass-finished beef in our diet has lots of positives. I will leave to the reader to decide what judicious means to you. A number of good vegetarians say to me that they don’t eat meat, but do include some in their children’s diet. Why? Because it’s just sensible. From time immemorial we have been omnivores. There’s a reason. I urge you to find a good local source for including beef in your diet. Grass-fed, grass-finished. That’s my beef. Enjoy!